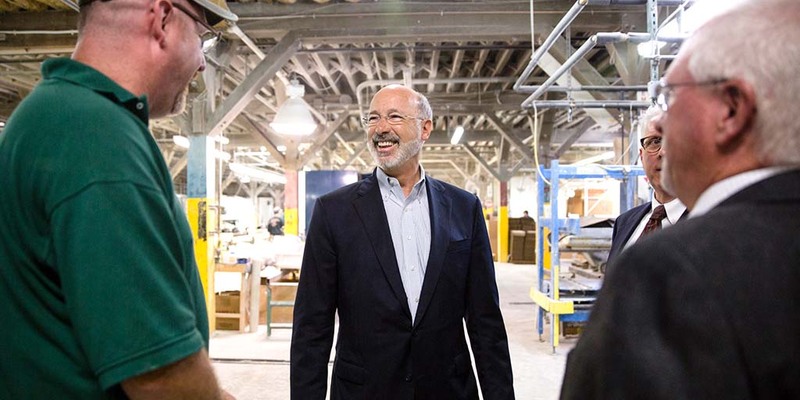 Harrisburg, PA – Building on his commitment to expand job training, Governor Tom Wolf today announced two new apprenticeships for tool and die makers and plastic process technicians in Northwestern Pennsylvania. In partnership with the private sector, the apprenticeships will prepare workers for new jobs in the plastics and petrochemical industries in the region. Apprenticeships are part of Governor Wolf’s PAsmart initiative to invest in apprenticeships, job training and science and technology education. In Erie, a tool and die makers apprenticeship with Executool Precision Tooling was approved by the Department of Labor and Industry’s Apprenticeship and Training Office (ATO). The Erie Institute will provide the related technical instruction. In Oil City, a plastic process technician apprenticeship with Keystone Community Education Council was recently registered with the department. Twelve regional plastics manufactures collaborated on the program. With nearly 200 plastic businesses in Northwest Pennsylvania there is a need for up to 400 new plastic process technicians. “Pennsylvania is becoming a major player in the petrochemical industry. Between Pennsylvania, Ohio and West Virginia, we are now the second largest producer of natural gas in the world. Plastics is a major component of the petrochemical industry and there is an incredible opportunity for growth over the next decade,” added Hummer. The Wolf administration created the ATO in 2016. The office has registered 119 new sponsors and 166 new apprenticeship programs or occupations. Pennsylvania now has 16,286 registered apprentices statewide. Visit ATO for more information about apprenticeship programs and the Apprenticeship and Training Office.